A printer has a one-off purpose – to print, yet there are so many types of printing, paper sizes, finishing options and requirements that its greatly important to identify the right types of printers to suit your individual business’ needs. From desktop printers and floor standing multifunction printers, right up to light production and large format printers, you can be certain to find your perfect match with Midshire. Small but mighty. Desktop printers are ideal for small teams and work groups, who need constant access to a printer. 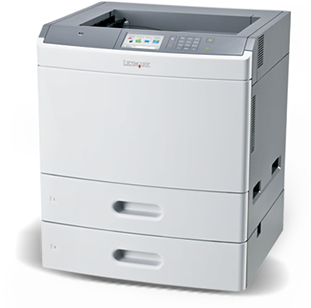 Midshire can supply Ricoh, HP and Lexmark desktop printers. Desktop printers enhance the utilisation of office space, they are compact and sit comfortably on a desk, increasing available floor space. As technology is advancing, you will find that a desktop printer designed for commercial use is as fast and produces as high a quality output as any office printer. If your printing requirements are minimal, i.e. you only need to print low volumes of documents in black and white, there is no point spending money on a larger device. Instead, a mono desktop printer proves to be the most cost efficient option. GelJet printers are the latest in printing technology from Ricoh. These printers combine features of both inkjet and laser printing, making them ideal for companies that want a printer that has optimum print speed, produces high quality print, whilst remaining affordable. Ricoh’s unique gel is a viscous ink that sets instantly, producing a solid, water resistant image on plain paper, which doesn’t bleed or smudge, making it ideal for printing that is likely to come into contact with water. Midshire has recently installed the largest fleet of Ricoh GelJet printers to OneStop convenience stores across the UK. 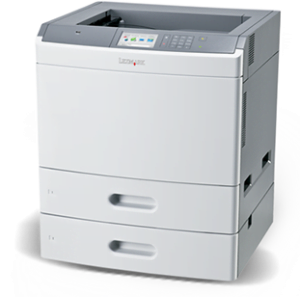 Office printers are suited to larger workgroups that only require print functionality from their device. These printers are therefore able to cope with high print volumes. Rather than being desktop based, office printers will be floor-standing, allowing for more paper to be stored within the paper trays. Most office printers are able to support paper up to A3 sized, which can be helpful for many businesses who need to print off spreadsheets or posters. 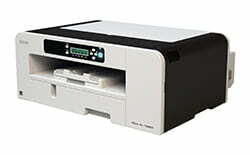 Print speeds tend to vary by manufacturer and model, but generally, if you have more than 5 users, you will probably need a printer that is capable of doing speeds higher than 20ppm. The majority of medium to large businesses today require their printing devices to do more than simply print. Instead, they want their one device to scan, copy and fax as well as simply print. This is where the all-in-one printers comes in. 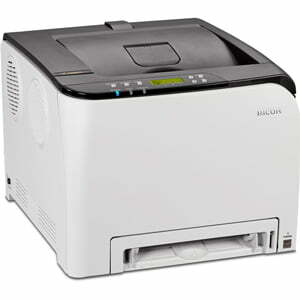 Also known as multifunction printer, all-in-one printers are an integral part of any office. As well as the standard print functionality, many devices are now classed as multifunctional. These all-in-one printers have the capability to photocopy, scan and fax as well as simply print. You also have the option to increase further the ability of your device by adding a selection of finishing options. It might just be an additional paper tray to handle long print runs, or it could be more complex finishing options, such as, stapling or booklet making. Also known as wide format printers, large format printers are capable of printing on a larger scale than your standard office printer. 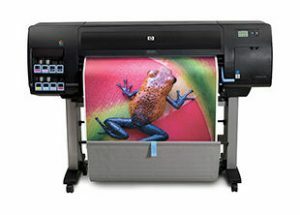 Most large format printers have the ability to print on A1 and A0 size paper width. As many devices are roll fed, the length of output can run into many metres. You also have the option to print onto different media types, including photo paper, technical papers and coated papers. As a HP Gold Partner and DesignJet Production Specialist Centre, we supply and service HP large format printers and can even provide these on a new ink inclusive contract. An ink inclusive contract means you pay for all ink and service in one managed cost. The costing for this type of contract is determined as a price per millilitre of ink use. Production print has changed significantly over the last five years, with one of the main changes being the introduction of light production digital printing machines, which were specially designed by leading manufacturers to plug a gap in the market, allowing companies to move their out-sourced print into the business. The main difference between light production printers and office printers or all-in-one printers is speed, allowing you to reach ultimate levels of efficiency. 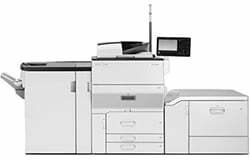 Here at Midshire we have an extensive range of new-age, affordable light production printing machines from Ricoh to Sharp. You also have all the production tools you need, as there is a whole host of finishing features to select from, including hole punching, booklet making, special trays, banner printing and large volume stacker trays. Not sure what types of printers would be best for your business? 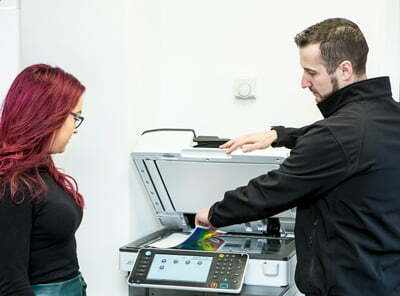 Then take advantage of Midshire’s Try Before You Buy scheme – you can have the printer of your choice installed into your business for up to 30 days and use it as though it were yours and ensure that it meets your requirements. All you have to do is cover to costs of your consumables and paper!